I love buying books. I live with a group of other bibliophiles, one of whom works in publishing, and general consensus is that if we wanted to build a whole other flat out of the books contained in this one, that would be possible. Books are nice things to own. They are also, in certain situations, a pain in the arse. Click, y’know, to embiggen and read the book titles. 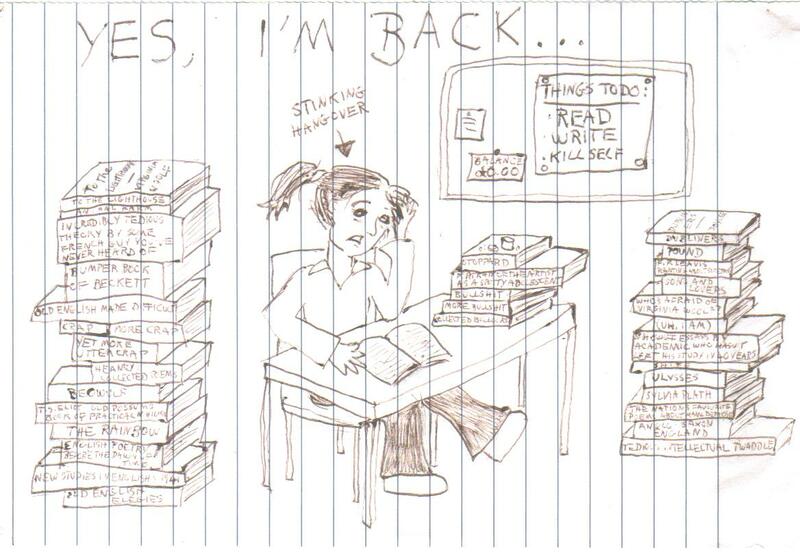 I drew this when I got back from the Christmas holidays in my first year of university, and I found it when I cleared out my books two years ago. So it feels suitable. I treated my undergraduate English degree partly as an excuse to acquire what I rather grandly referred to in my head as a ‘library’. One of my most dearly cherished ambitions has always been to live in an old house with a library with one of those secret doors in it. For this to work all your books have to be bound in vaguely-similar morocco leather, but hell, I bought a great number of Penguin Classics regardless. And the cheap Oxford World’s Classics with the dingy brown covers. And secondhand editions of everything from the Oxfam Bookshop in my university city, whose spines proclaimed that at some point they’d been purchased or pilfered from the English faculty library. I carried them up and down from home to university accommodation and back again, and when I graduated and ran away to London they stayed in my childhood home. The problem is that having a ‘library’ makes you weighty, makes you take up a lot of room. If you find yourself having to move your stuff out of a soon-to-be-sold house in a hurry, in your mid-twenties, while unable to drive, your collection of books may turn speedily from a treasured possession to something of a problem. None of the books I own are particularly valuable, few are irreplaceable. The idea of taking them all to the charity shop was still sad. Thankfully, I was rescued by a lovely friend who had a car and was, with stupendous luck, in the area with it. The books are still a bit of a problem, though. They take up space in an overcrowded flat. When I move I’ll have to ship them with me. I still can’t drive. I am a mild failure at normal human being things. …in which I attempt to limit the damage to your wallet, and to your lower lumbar region. Should I buy all of the books on my reading list? Long answer: It’s nice to have your own copies of texts so that you can write your own notes in them if you want. That’s pretty much the main reason why you buy a text to study rather than borrowing a library copy (well, that and bibliophilia). I know that people do write their own notes in library copies of things, but that’s not a nice thing to do. I love early modern marginalia, but modern marginalia is usually just annoying. Sometimes reading a book I’ve taken out from Senate House can feel like standing next to that guy at a gig who will not shut up singing along even during the quiet songs. It’s good that you’re engaging (and sometimes when you write ‘No!’ and underline it three times it’s funny), but everyone else came to hear the band, not you, so maybe dial it back a bit. But as well as the aforesaid logistical problems, there’s a rather big issue here. Books are expensive. In these days of insanely expensive higher education, buying books may seem like yet another university-related thing designed to ruin you financially. Short answer: It’s up to you. Long answer: It’s nice to buy, if you can. And you might be required to buy some texts. But with a bit of careful planning, a lot of expense can be avoided. Firstly, check your course information carefully. There may be set texts you’re required to have, perhaps in particular editions, for an exam or whatnot. You will need to buy these, even if, say, The Norton Shakespeare is super heavy and you don’t want to carry it around. Your seminar leader has to carry a copy around, so so do you. In no way am I expressing a personal frustration here. Having said that, there might be a deal in which a campus bookshop sells these texts at a discount – in which case it might be best to wait until you get to university to buy them. Similarly, there might be course packs of criticism and whatnot, which you’ll receive when the course starts. Check up about these before you splash the cash, and plan your purchasing accordingly. Required editions of texts aren’t usually cheap, because footnotes cost money, y’know. But they’ll be affordable, because a) Course convenors need you to buy these texts, and b) Academics want you to be able to afford higher education, even if the government does not. Secondly, think about how you read, and about how you read different types of text. For example, I tend to want to make more notes on poetry and plays than on novels. Partly this is a length thing – novels are usually longer than plays or poetry, although, well, Paradise Lost, etc. Annotating my copy of Great Expectations to the extent to which I annotated my copy of Browning’s poems would take a very long time. Partly it’s a typographical thing. It tends to be harder to cram in notes around the densely-packed lines of a prose text than it is around the widely-spaced lines of a play or poem, and it disrupts reading to a greater extent. You’ll notice, if you’re in the habit of reading scholarly editions of texts, that novels usually have notes at the end of the book, whereas plays and poetry tend to have them at the foot of the page. The editors of novels tend to be concerned that checking the notes will interrupt the flow of the story, so put them at the back where they’re accessible to the reader but don’t intrude upon their experience. The editors of plays and poetry, meanwhile, are less bothered about interrupting the story – they want to make the information in the notes accessible as soon as possible to the reader. In other words, you are cued to different sorts of initial readings. I’ll go into this in more depth in a later post [ETA: I haven’t written this yet. But I plan to! …when I’ve finished my thesis], but it’s worth noting here that an initial reading of a novel (especially a long one) is likely to be fairly plot-focused, thus requiring less input from your pen (or pencil. I always use pencil. I suppose I have the vague feeling that someday I’ll erase all my notes). …then I see no earthly reason why you can’t read library copies, or copies borrowed from other people, of said novels first and then borrow copies from the university library when you need them, and/or buy your own as need, opportunity, desire and funds dictate. 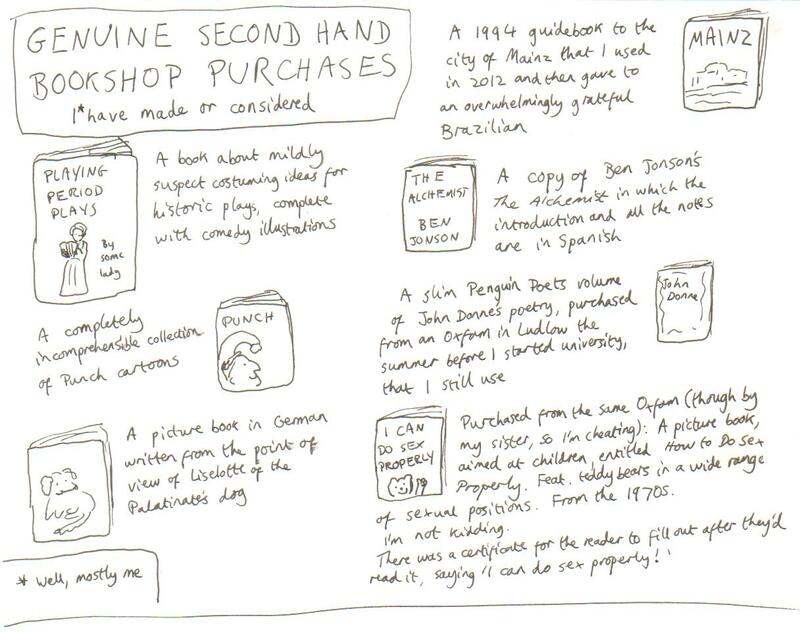 Which brings me onto: how to acquire said books. The library near my mum’s house is absolutely tiny. By far the biggest section is several shelves of short hardback novels about cowboys. They have covers in bright primary colours featuring excessively bow-legged young men threatening to shoot each other. They have titles like Gun-Slingin’ Maverick and Dead Man at Fisher’s Creek and if I ever have to move into my mum’s I’m going to read them all and blog about it. Anyway. This may not seem like a promising place to find the books you need to read for an undergraduate English course. But never fear! Let me introduce you to the wonder of – the inter-library loan. See, the little western-themed library near my mum’s is in the same county as several much bigger libraries – so if the little library doesn’t have a book I need, I can borrow it from Exeter or Tiverton or Plymouth libraries. You should be able to search for books via the online catalogue linked to from your council’s website – here’s Devon’s for an example. You should be able to see some publication details (at least the ISBN, which will tell you which edition it is), where copies are held, and whether they’re on loan. You may well also be able to request an inter-library loan by logging in and specifying your local library. Alternatively, you can do what I did in the olden days, and go to the library and ask a librarian for help. Librarians are also brilliant. A brilliant option. Just make sure to return them at some point, and not to write in them, or break the spine (if it’s not already broken) or turn down the pages to keep your place. Basically don’t hurt the books. Also goes for library books. The best way to get cheap books. Also the best way to emerge blinking into the light of the High Street clutching a 50p LP of Marvin Gaye’s Greatest Hits and a book about crocheting pincushions to look like celebrities’ faces. Dangerous for lovers of the bizarre. Trawling through second-hand bookshops is a fun activity but it’s not always great way to find specific editions of texts (although it’s worth asking the person behind the desk – bookshop proprieters often have a scarily precise knowledge of their stock, and they aren’t all like Bernard Black). For specific editions, it’s probably better to go online. Abebooks is probably the most useful site – it has listings from lots of bookshops and online booksellers. Pro tip – if you find a book you want online from a bookseller close to you and you’d like to pick it up in person to save on postage, call the shop and get them to keep it back for you. Oxfam have a good website, eBay can be good for second-hand books, and I probably don’t need to mention Amazon, do I. Some students choose to sell their books once they’re done with them – you may well see notes advertising this pinned up around university. It’s a good way to pick up set texts and critical works on the cheap. Not something to bank on, but worth bearing in mind for later on. E-books are great. I like them a lot. But they are not good for writing essays with.